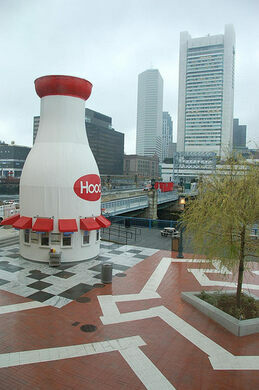 Standing 40 feet tall, this giant milk bottle sits next to the Boston Children’s Museum, just across the Fort Point Channel. In 1930, Arthur Gagner built the milk bottle next to his store to sell his homemade ice cream. Gagner built the structure entirely of wood, and while these days people are now quite used to this kind of novelty architecture, at that time it was one of the first. Radical Bookstore and Community Space. Gagner sold his giant bottle in 1943. By that time the shape of milk bottles had already changed to a square squat style bottle, dating the large bottle, and by the 1960s, like glass milk bottles themselves, the bottle was abandoned. It stood empty and neglected for a decade when H.P. 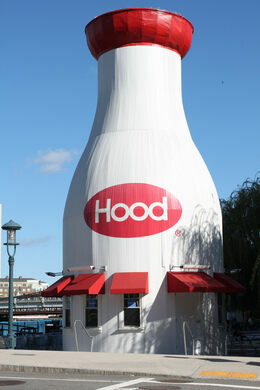 Hood and Sons, Inc. a dairy company, was persuaded to buy it and give it to Boston Children’s Museum in 1977. Shipped to Boston by ferry on the “Great Bottle Sail” the bottle has called the Boston Children home for the last thirty years. 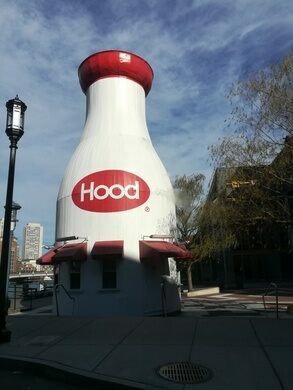 Now sporting the phrase “It’s Hoods be Good.” it is an ice cream stand – Gagner would have been proud – and snack bar during the summer and there are tables nearby where you can sit and relax. Occasionally movies are projected onto the large white bottles side. At 40ft tall and 18ft in diameter it would take an estimated 58,620 gallons of dairy product to fill the monster milk bottle. The top half of the bottle was recently cut off and preserved, so that the bottom of the 15,000 pound bottle could be moved and restored. Despite being such a clear relic from the past, Arthur Gagner’s giant milk bottle seems to have a long future ahead of it. In front of the Boston Childrens Museum. I-93 exit 20. Follow signs to I-90E -- in the tunnel take exit 25 -- then follow the signs to "S. Boston." At end of the ramp get into the left lane and turn left onto Congress Street.